When you witness Ron Howard’s latest motion picture, Rush (2013) you better buckle your seat belt. 123 minutes of exhilarating action directed by Oscar-winning Howard is not something that is going to relax you – this is ‘on the edge of your seat’ cinema. The film is like an F1 race itself as described by writer Peter Morgan (Frost/Nixon) at a Q&A after the screening. Morgan, who is good friends with Niki Lauda, managed to create a fantastic rivalry all shaped by first hand experiences and memoirs of racing’s bad-boy James Hunt which allowed for the film to be as brilliant as it promised. 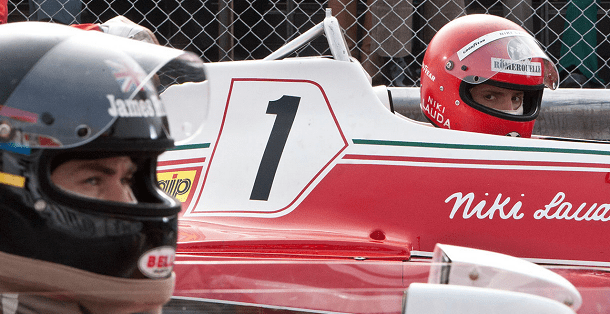 The story follows the unmatched rivalry between two of racing’s most iconic drivers, James Hunt (Chris Hemsworth) and Niki Lauda (Daniel Brühl). They both came through the ranks of amateur racing together and their close encounters sparked this life-long contest which is documented right through until the peak of their careers in Formula 1. As womanising Hunt parties in rock star fashion with his new found love for money and his old Achilles heel for women, Lauda is conservative and meticulous in his training striving for success. However, both racers have an extreme appetite to win, so much so they are willing to risk their life to cross the black and white flag first. Their livelihoods are dictated by this eagerness to become champion and as their lives come to their final cross it is wonderfully depicted by Howard who continues to tighten the rope of tension as the film reaches it’s most invigorating stages. Chris Hemsworth, who plays James Hunt, is as charismatic as ever and his excellent British accent compliments his fantastic performance. He represents all the promiscuity of Hunt as well as his passion for racing. Brühl, as Lauda, is also extremely convincing and plays a wonderful supporting role as he battles with the horrors of his crash. By depicting the painful rehabilitation, it shows that Howard would not shy away from the severity of the implications the crash caused which produced many skin-crawling moments. This film is a must see for all racing fans or anyone interested in the life of British icon James Hunt. The film centers on the racing but there are many other issues tackled including alcoholism and depression. It is a fantastic watch. It highlights the dangers of racing in the 70’s as well showing the respectful rivalry between both Hunt and Lauda. Although they both had a burning desire and passion to beat each other on the track they had an unspoken respect between them as both risked life and limb to get their hands on the championship. You need to see this film! See this film at your local Cineworld which can be found here.